← Judith G. Loredo, Ph.D.
Vincent F. Sica is a former teacher with The New York City Department of Education. In his previous capacity, Mr. Sica coordinated various student programs at Franklin K. Lane High School, and taught English, remedial reading, writing and thinking skills at the school for 20 years. He also taught special education at Aviation High School for three years prior to his retirement. Mr. Sica retired in 1995, after 33 illustrious years educating middle and high school students. Beginning in 1962, he taught English and drama classes to high school students at all grade levels. He also served as the director of his school’s drama club and horseback riding club, and as coordinator of various programs. From 1965 to 1968, he taught English and theology classes to seventh, eighth and ninth graders, and led the Notre Dame Boys Choir as well as an adult choir in Queens, N.Y. From 1974 to 1993, he taught English and writing classes for grades nine through 12 at Franklin K. Lane High School. 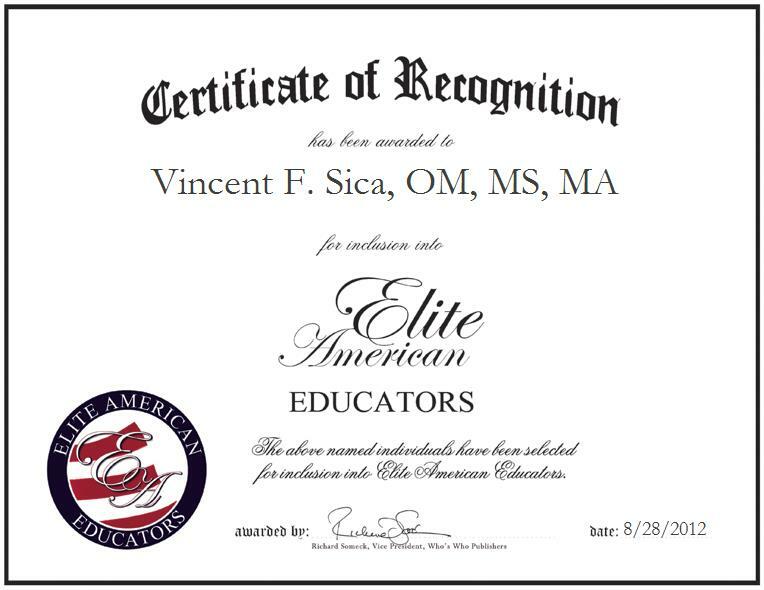 Mr. Sica worked as an educational trainer and college band coordinator at Lehman College, and was the co-creator of a remedial reading and writing center. From 1993 until the end of his career in 1995, he taught English, remedial reading and writing, and special education classes at Aviation High School. Mr. Sica was briefly a Franciscan monk.